Soapstone is a material that has been used in New England homes for hundreds of years. From fireplace hearths, wood stoves, sinks, to countertops – soapstone can literally outlive your home. And if you are going to invest a chunk of change in your countertop, that seems pretty important to us. What? Soapstone is a metamorphic rock, which means that the rock has been altered by heat and pressure over time. It is largely composed of mineral talc, which gives it that soft to the touch texture we really love. How? Soapstone is quarried like granite and marble. Mining does of course require the use of non-renewable energy to get from point A (mine) to point B (your home). We’re told mining soapstone is less impactful than granite or marble because there is no need to cut away large chunks of landscape, or dig deep into the earth. Soapstone mines are also much smaller. Soapstone is typically sourced from Virgina, Brazil, and Finland – check with individual manufacturers to see where theirs is sourced. Why? Our favorite thing about this material is that it gets installed in your home in its natural state. You get to enjoy the natural texture of a natural stone. Beyond having to cut the slab to size, or alter the edging if desired, there is no need for any additional modifications. No sealers. No chemicals. Just add a little mineral oil now and then to assist with an even color tone as the stone naturally darkens over time. The Goods. Soapstone is completely non-porous and impenetrable, so naturally stain and bacteria resistant. It is also completely resistant to acids and heat, hence why it has been used in chemistry labs or for heat stoves. You can move a pan from the stove to your counter without a trivet. 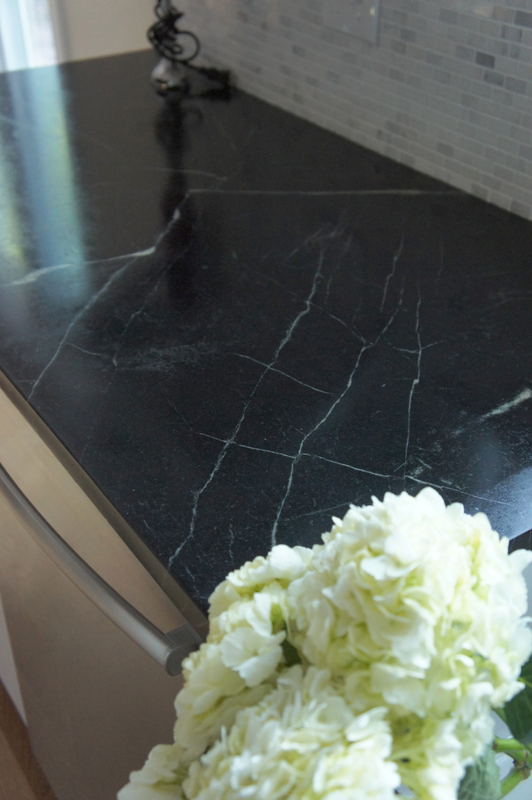 Since soapstone is a soft stone with no sealant, you may notice it can scratch more easily than a granite. Good news is that you can refinish soapstone time and time again by sanding it down. Colors range from light greys to dark blacks, and some have blue or green hues depending on where it was mined. Veining can range from almost none, to lots. Some slabs have very large veins that give an abstract painting sort of effect, and some veining will have color. We have found that some clients love the veining, whereas others want a more even-tempered look. A great opportunity to play with design intent. Tip: Some manufacturers only carry 1-2 types, so before you (or your GC) commit to working with a specific manufacturer, check to see what they offer. You may need to do a little investigating. Always see your whole slab first (or send your designer) and identify what sections should be templated for the designated counter areas. We used Soapstone in a recent kitchen renovation and paired it with a Carrara marble tile backsplash and stainless steel appliances. Timeless, beautiful, and durable.